We strive to offer the perfect gathering place for a satisfying meal in friendly surroundings. We hope you'll join us for a casual meal and take in the sights of this vibrant community here on the Suisun City Waterfront. At Athenian Grill, we offer a variety of menu items to suit the most diverse apppetites and preferences. You'll find something to please everyone in your group, from the weight watcher to the power eater, from the vegetarian to the carnivore, from the picky toddler to the adventurous gastronome. Choose from many light and healthy selections, or just go for the double pastrami burger! Complement your meal with wines and brews from our eclectic list featuring local producers and Greek imports. Did you catch this article in the Dec. 1 Daily Republic? © 2017 by Athenian Grill. Site developed by Stacey McNeill. 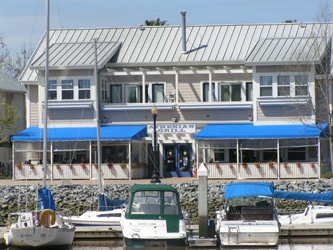 Suisun City Waterfront District Passport Card offers regular discounts with participating merchants. Pasta layered with seasoned ground beef, topped with bechamel sauce and baked to a golden brown. OK, so maybe it's not officially Greek, but it IS one of our specialties. Whether served on a soft roll with ..... or in our famous Pastrami Burger, if you're a Pastrami fan, you've gotta try it.